Kids love seeing Dr. Nick! Welcome to Innate Health Chiropractic! Our goal is to locate the cause of your specific health challenges. When you arrive at our office you’ll be greeted with a huge smile and welcomed as a member of our family. Immediately you’ll feel like we’ve been waiting to see you all day, and it’s true! We’ll give you a tour of the office to ensure that you’re comfortable, relaxed and feel right at home. Intake Forms: We will ask that you complete our new patient forms available in the New Patient Center prior to your first visit. This paperwork provides us with your health history and information we need to better serve you. Consultation: You will sit down with Dr. Nick for a detailed discussion about what’s causing your health related concerns. The purpose of this visit is to learn more about you, your expectations and how chiropractic can help you reach your health goals and find true healing. Analysis: Dr. Nick and his team will conduct a thorough chiropractic examination to determine if there is evidence of vertebral subluxations (neurological stress). We will gather all the information needed to ensure we are able to help you! Our state of the are exam suite is equipped with digital x-ray and the Insight Millennium Scanning Unit. The Insight has been used in NASA’s space program and has been Space Certified by the Space Foundation. This technology gives Dr. Nick the most comprehensive look at how the master control system in your body is functioning (nervous system). Not only is Dr. Nick able to determine if he can help you, with this technology he is able to accurately measure your progress along the way. Hands down the most important scan you will ever receive in our office. Duration: We ask that you plan on spending 45 minutes with us for your initial visit. Everyone has been extremely friendly and knowledgeable! They make you feel like their only client! Once all of the information is gathered, Dr. Nick will discuss his report of findings with you. This will give you a blueprint on how we can achieve your health goals. We’ll discuss our recommendations for care and ensure all of your questions are answered. At the conclusion of this report you will receive your first chiropractic adjustment. 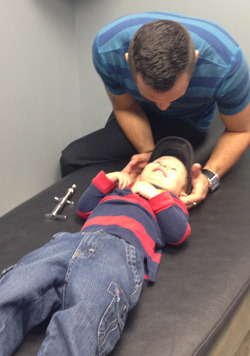 At Innate Health Chiropractic, expect to be treated like a family member on every visit. Call (419) 872-2255 and schedule your first appointment.